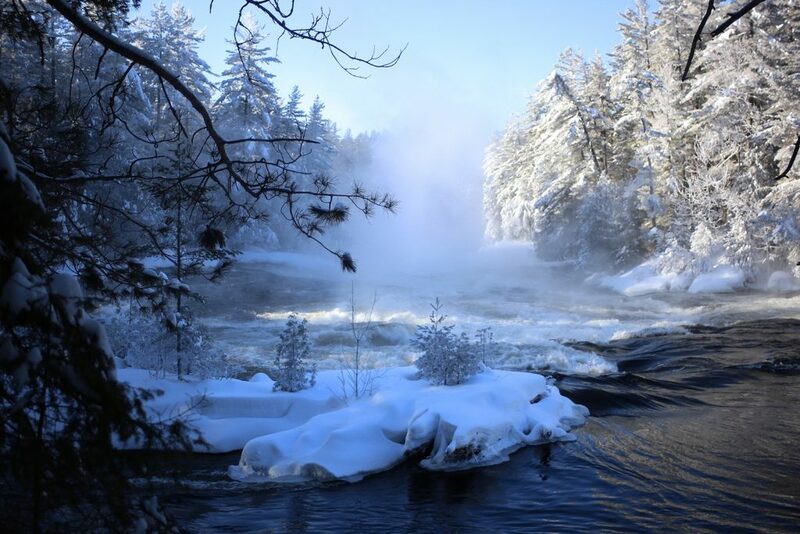 Steam rises from the Kipawa River in Quebec’s Parc national d’Opémican on a frigid winter morning. Parc national d’Opémican, which protects 252 square kilometres of forested land between Lac Témiscamingue on the Ontario-Quebec border and Lac Kipawa, is located about a four and a half-hour drive from both Toronto and Ottawa. The park is the realization of a nearly 40-year dream for people in the Abitibi-Témiscamingue region who wanted to see the remains of the timber rafting relay station at Pointe Opémican preserved. In the 1880s and 90s, squared logs of white and red pine bound for Britain or America were assembled here into enormous rafts, sometimes consisting of as many as 3,000 individual logs, before being driven down the Ottawa to Montreal or Quebec City. “Pointe Opémican was a unique place at that time,” says Dany Gareau, the park’s director. “It’s the only place where things were organized like that, and people there were even developing techniques and tools to improve the job,” including larger-than-normal booms capable of handling the frequent high waves on the lake. The Auberge Jodoin, one of several historic buildings at the heart of Parc National d’Opemican. Built in 1883, it served as temporary accommodation and an outfitter for the raftsmen who floated logs down the Ottawa River. Today, Pointe Opémican forms the heart of the park, which is divided into three sectors. 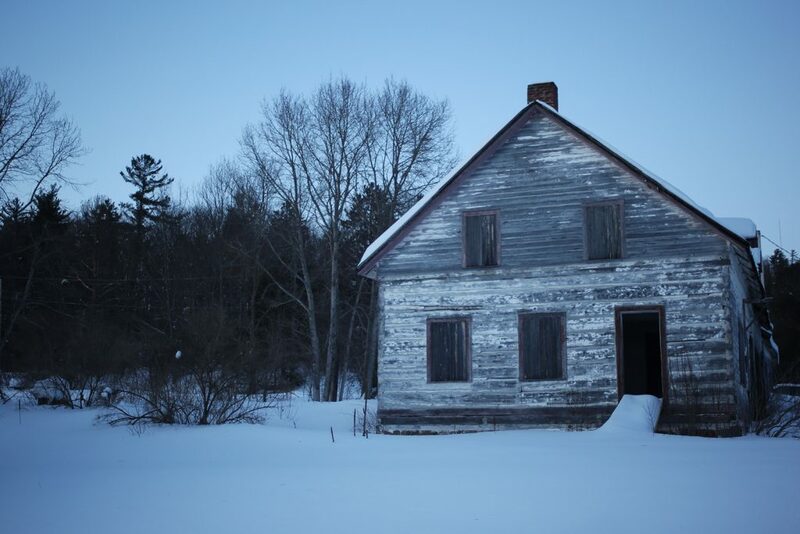 Several structures dating back to the late 1800s, including a blacksmith’s workshop and the “Auberge Jodoin,” which served as temporary accommodation for the raftsmen, are being restored and will house interactive museum displays about the history of logging on the Upper Ottawa. A visitor centre and campsites are also being constructed around the point. The northern part of the park, accessed via the hamlet of Laniel, is called the Rivière Kipawa sector. It was there that I met Gareau on a frigid morning in January for an early — and decidedly wintery — look at some of the natural wonders waiting to be explored in Parc national d’Opémican. Conventional campsites are available in the Rivière Kipawa sector, as well as four Étoile ready-to-camp units that sleep up to six people in comparative luxury (think Parks Canada’s oTENTiks). 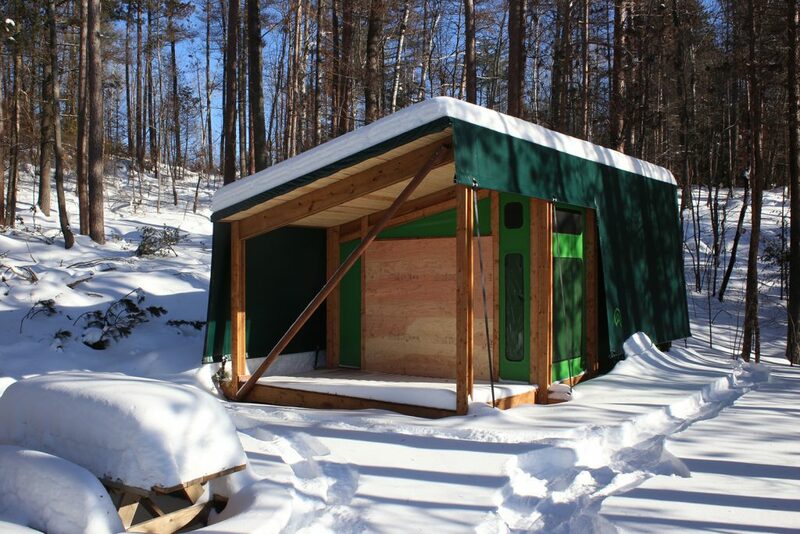 One of four Étoile ready-to-camp units in the Rivière Kipawa sector of Parc national d’Opémican. Our first stop was the Grande-Chute hiking trail. 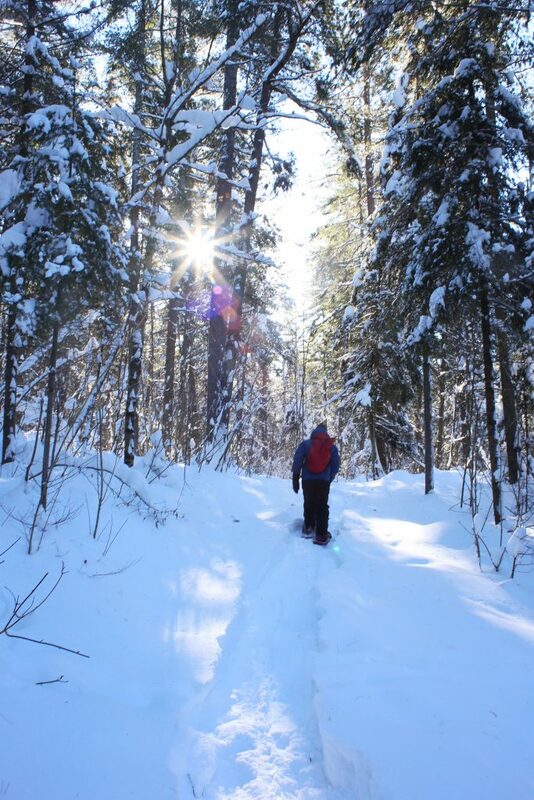 In the summer, this is an easy one-kilometre round-trip walk with several scenic lookouts onto the Kipawa River, culminating at a thunderous waterfall. 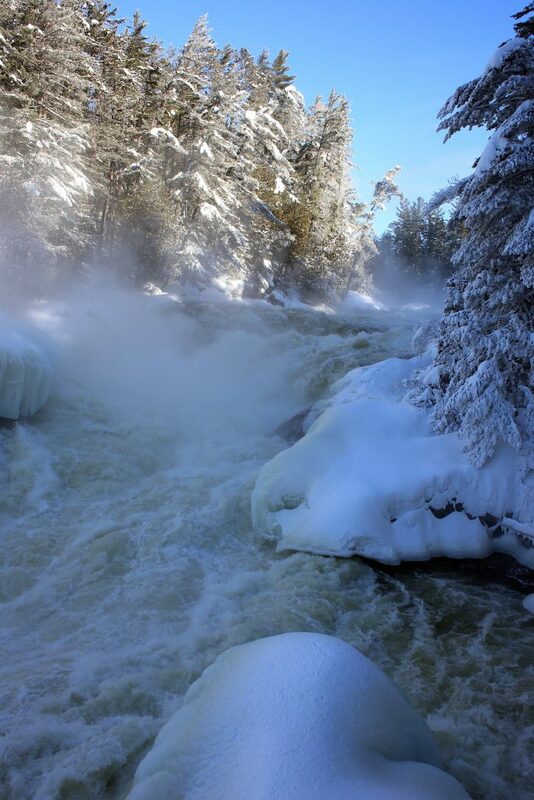 In the winter, the sight of the steam rising from the rushing water to frost the branches of the pine trees above is enough to take your breath away. This stretch of river will be familiar to whitewater enthusiasts: over the course of its last 16 kilometres, the river drops 90 metres, creating several class II and III rapids. For one weekend each June, canoeists and kayakers gather here by the hundreds for the Kipawa River Rally, a race from Laniel to the river’s mouth at Lac Témiscamingue. The view from one of the lookouts on the Grande-Chute Trail, which follows the Kipawa River. The “Grande-Chute,” a waterfall with a 15-metre drop near the mouth of the Kipawa River. It’s important to note that while the park is open year-round for recreation, during the off-season from mid-October to mid-June, it is not staffed, so visitors must be self-reliant and register online or at the self-serve kiosk at the Kipawa River Road entrance prior to setting out. 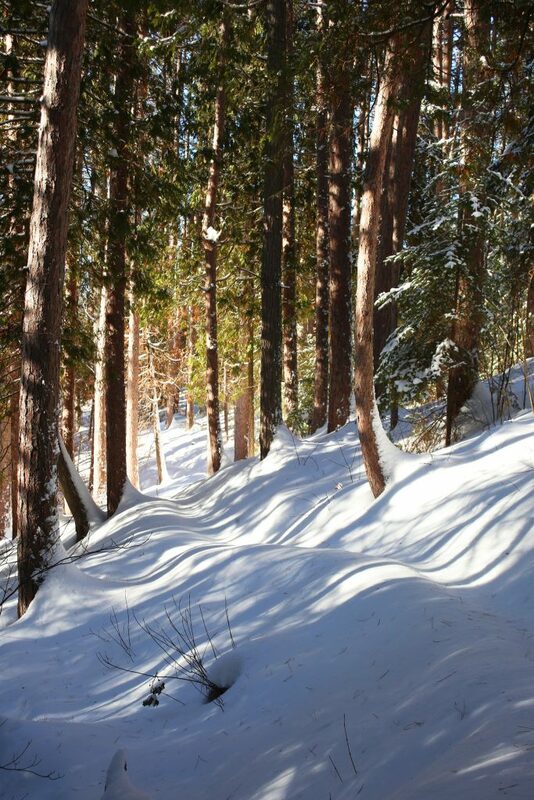 Snowmobiles and ATVs are strictly prohibited, but snowshoeing, cross-country skiing and other non-motorized activities are permitted. Closer to the mouth of the Kipawa River is the 1.1-kilometre Inukshuk Trail, which leads to a lookout atop steep cliffs over Lac Témiscamingue. As a snowshoeing neophyte, I found the occasionally steep path challenging, but fortunately a moose had already done some of the hard work of breaking in the trail for us. The late afternoon sun casts long shadows across the deep snow on the Inukshuk Trail. 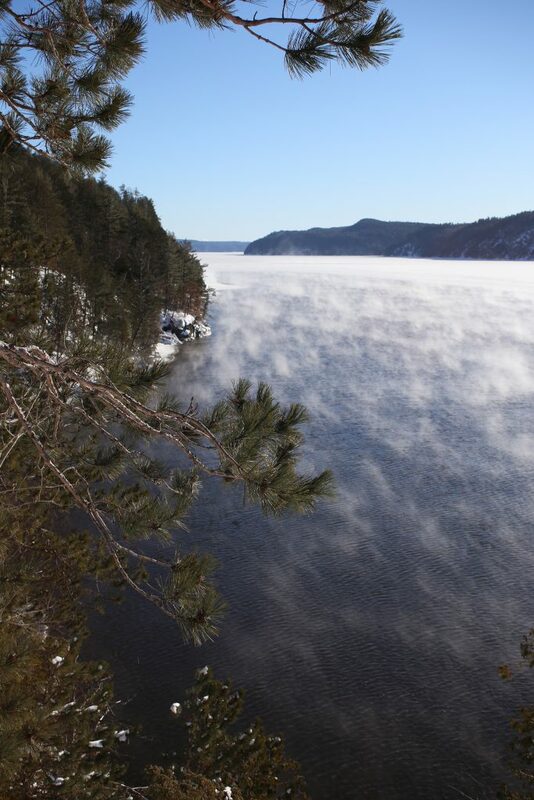 Steam rises from the surface of Lac Temiscamingue as it freezes on a -27 C afternoon. The road to the official opening of the park has been a long one. Community groups first approached the Quebec ministry for forests, wildlife and parks in 2002 with a proposal to save Pointe Opémican by integrating it into a provincial park, but it took more than a decade of study and public consultation for the ministry to finalize the boundaries for the park. In 2013, responsibility for the development of the park was transferred to the Société des établissements de plein air du Québec (SÉPAQ), a crown corporation that manages the province’s 23 parks and 15 wildlife reserves. As construction began on the roads, campsites and visitor centre, SÉPAQ struck a roundtable made up of representatives from the local municipalities, including the Wolf Lake and Kebaowek First Nations, to keep them updated on the progress. Now, she says, with the park’s opening imminent, uncertainty has given way to excitement at the possibilities for showcasing the region to a national and international audience. Dany Gareau, director of Parc national d’Opémican, snowshoes on the Grande-Chute Trail.